FM Connect Give is the Free Methodist online giving system. This page will help you understand how you can best utilize this giving tool. Every transaction completed on behalf of a church requires logging onto FM Connect Give utilizing the assigned username and password. Church usernames and passwords are available through each conference office or Free Methodist World Missions. If you need assistance, please contact Debra Hancock at debra.hancock@fmcusa.org or 800-342-5531 ext. 232. Reviewing these two “best practices” documents will help your church process online giving and commitments smoothly and efficiently. FM Connect Give is located at give.fmcusa.org. "Give" links appear on every page of fmcusa.org. You'll find one in the top-right corner above the search bar and another at the bottom of the page under "Tools." If you're used to giving at fmcusa.org/fmmissions, you can still do so. Missionaries, world areas, and other giving opportunities all have "Give" buttons that link directly to FM Connect Give. Exploring fmcusa.org/fmmissions is a great way to stay up to date on the latest news from the mission field. While it's possible to make a donation without an account, creating an account gives you the ability to view your giving history. FM Connect Give can generate a fully detailed history of your giving. You can view this at any time by logging in and clicking "Your Account." You can also use this area to keep your contact information updated. 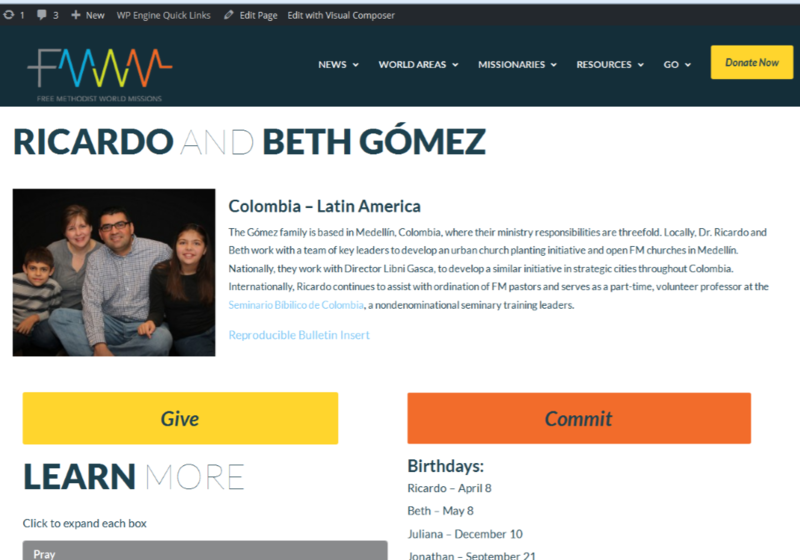 Once you've logged in, you will see all the giving opportunities on the left side of the screen. Clicking on a general category will expand it to show a list of giving pages. 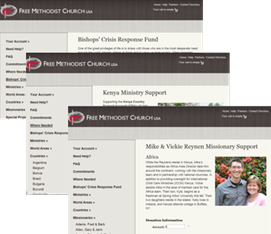 FM Connect Give also allows your to give to other Free Methodist ministries such as the Bishop's Crisis Response Fund. We are able to accept most major credit cards as well as transfers from your bank account. The legal name of the organization is Free Methodist Church of North America. Many ministries fall under the umbrella of the Church including International Child Care Ministries and Free Methodist World Missions. If you or your Donor Advised Fund, or other gift manager require a form W-9 to verify our Federal Employer ID Number, please email Tammy Randall at Tammy.Randall@fmcusa.org to request the form. We can be found on the IRS Exempt Organization Select Check list under our legal name. The city and state, to help narrow your search, are Indianapolis, IN and our Deductibility Status is GROUP. Here is a link to the IRS List IRS Exempt Organization Select Check Search Tool.